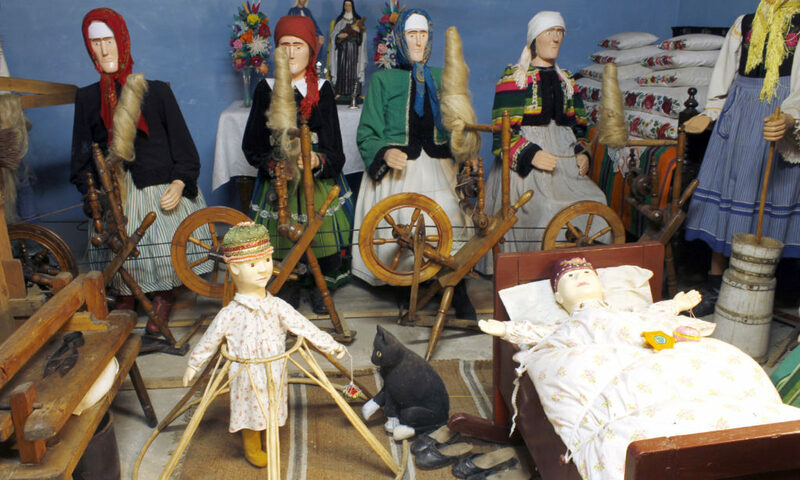 THE FOLK MUSEUM OF THE BRZOZOWSKI’S FAMILY IN SROMÓW – Welcome to the world of moving figurines. Welcome to the world of moving figurines. 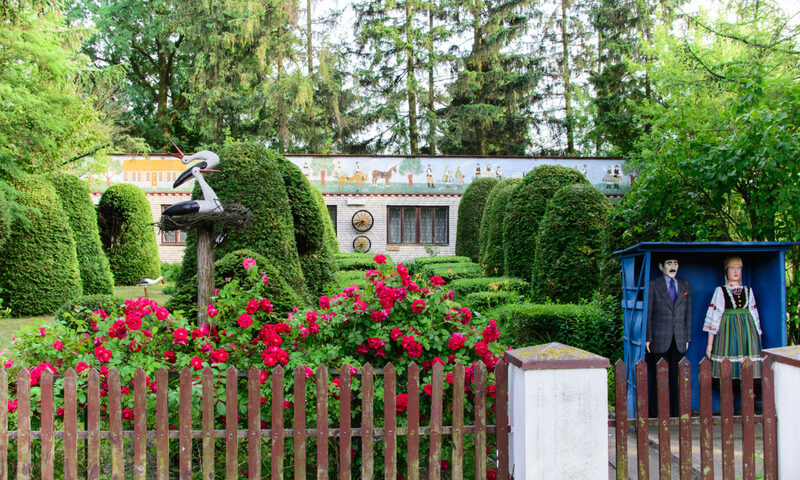 In the Folk Museum of the Brzozowski’s family there are handmade linden sculptures, colourful cut-outs, oil paintings and embroidery. 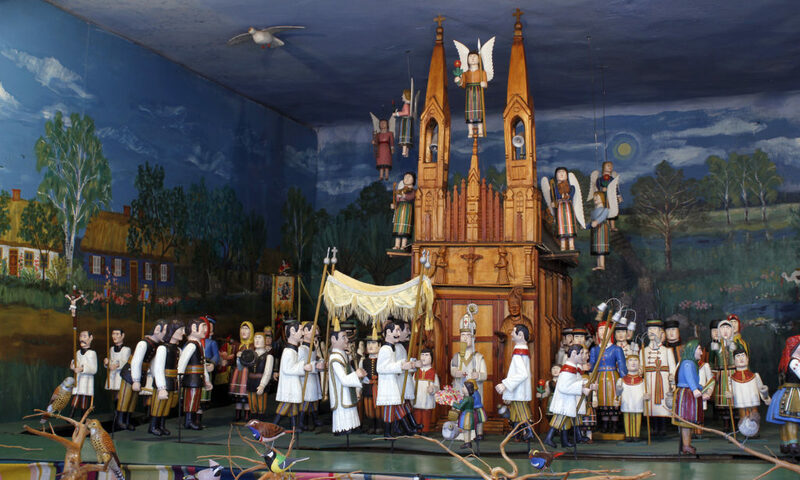 Over 400 wooden figurines (most of them are moving) show religious holidays and scenes of the life of Polish countryside (mainly in the area of Łowicz). There are also the most important characters from sports and history of Poland. In addition, in the exhibition buildings number 3 and 4, there are more than 30 horse carriages from the region of Łowicz. The Museum of the Brzozowski’s family consists of four different exhibition buildings, surrounded by a beautiful garden. At the entrance to the museum, guests are welcomed with a handshake by a full-sized wooden married couple. In the first building there are theme scenes with over 400 moving sculptures. There’s a wooden Nativity scene, a Corpus Christi procession, Polish hussars, a few fishermen by the river Bzura and a traditional wedding reception. Above the visitors’ heads there are folk decorations called “pająki”, which resemble chandeliers and they used to be a common decoration in old Łowicz cottages. On the walls there are traditional colourful paper cut-outs and oil paintings on canvas painted by Maria Kosińska. At the beginning of the second building there is a four season scene with famous Polish Olympic medallists such as Kamil Stoch and Adam Małysz (ski jumpers), a cross-country skier Justyna Kowalczyk and a speed skater Zbigniew Bródka. 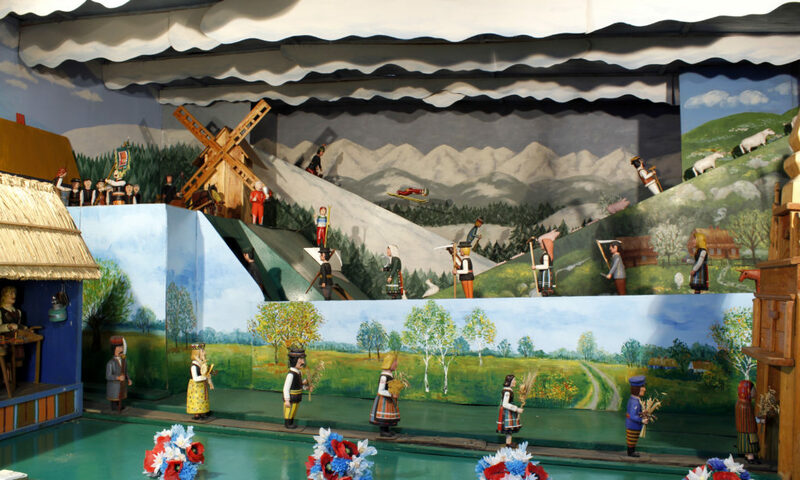 There is also a collection of hand painted dowry chests and full-sized sculptures in old-fashioned folk outfits. In buildings number three and four you can see a collection of horse-drawn carriages, mainly buckboards. On the walls there are horse harnesses and antique agricultural tools. You can also see a full-sized saddler making a horse collar and a cooper making a barrel. What’s more, there is also a full-sized horse and a family going back from a market accompanied by some piglets and hens. The museum is fully sponsored by the Brzozowski family who maintain and take care of the exposition every day. The founder of the museum was Julian Brzozowski, born on 26th February 1925 in Zabostów Duży. He died on 8th March 2002 and he was buried at the cemetery in Kompina. 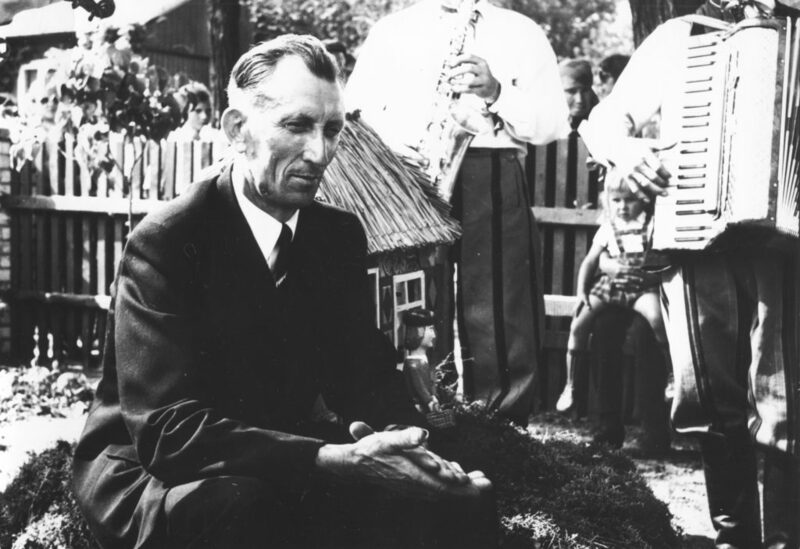 Julian came to Sromów in 1952 and he got married to Wanda Wasiota. He was a farmer and he had a 900 m2 agricultural holding. He had been interested in sculpting since he was a small boy. His first sculptures intended for being shown in the museum were carved in 1955. At first he carved in the kitchen of his house where Wanda cooked meals. He mostly carved during winters because he had more time then. The sculptures were kept in two rooms of his house and later in the garage. Around 300 sculptures had waited to be displayed in the museum for almost 20 years. Julian Brzozowski built the first exhibition building due to money earned on the farm. The official opening of the museum took place on 30th July 1972. Then, it took 10 years to create the sculpture moving scenes. All the mechanisms were planned and made by Julian himself. The next exhibition buildings were opened in 1983, 1986 and 2001. There are 4 exhibition buildings together. Julian’s mother Franciszka Brzozowska was a talented cutout maker and embroiderer. 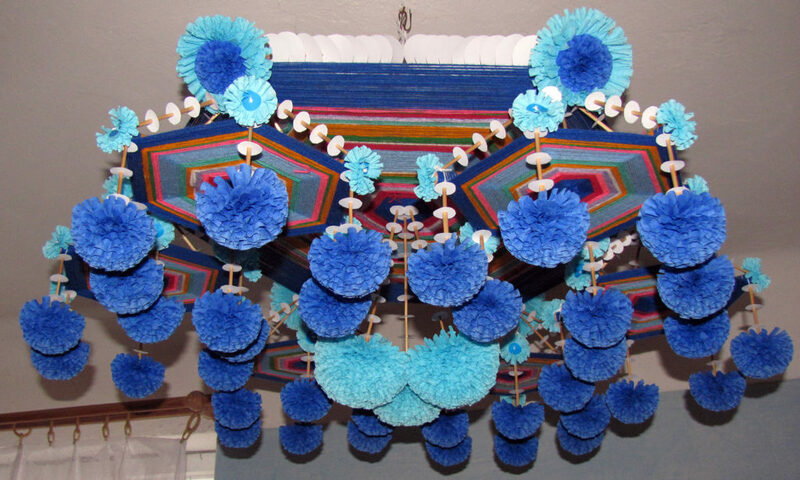 She made beautiful ornaments called „pajak lowicki” (It’s a kind of a folk ornament which resembles a chandelier and it’s made of light materials such as straw, colorful wool and tissue paper flowers). She died in 1974. Franciszka’s brother Stanislaw Wojciechowski was a sculptor too. Unfortunately, none of his sculptures survived. Julian was fascinated with the sculptures every time he visited his uncle. He especially liked sculptures called „grajek” (These are wooden sculptures which are moved with a crank). Probably this was the beginning of Julian’s dream to crave his own sculptures and build a museum. Julian’s wife Wanda Brzozowska (1931 – 2003) had always supported Julian to fulfill his unconventional plans and dreams. She was a cutout maker as well. She created amazing tissue paper ornaments and flowers. 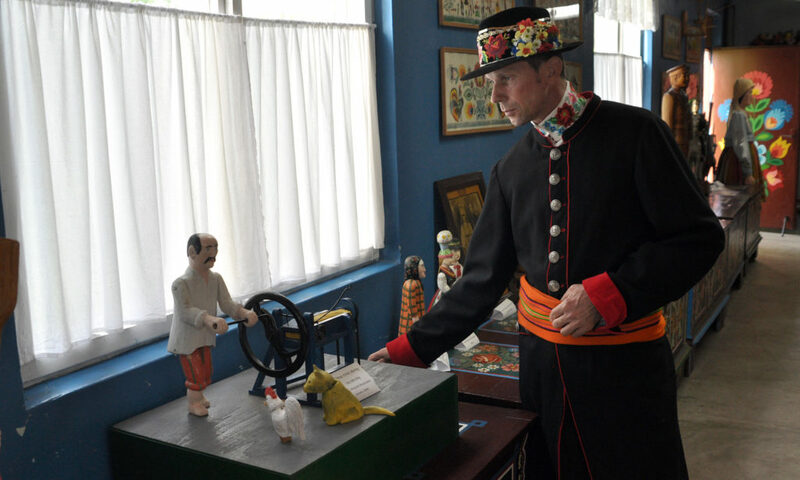 Now the owner of the museum is Julian’s oldest son Wojciech Brzozowski. He has been a sculptor since the mid-eighties. His sculptures are displayed in all the exhibition buildings and in the gardens around the museum. Wojciech leads a 1000 m2 agricultural holding and takes care of the museum. 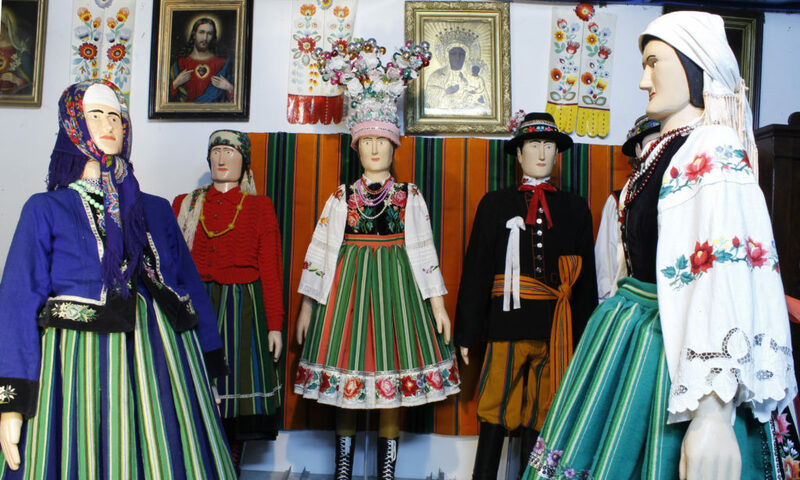 Wojciech’s wife Renata makes folk ornaments as well which you can see in the museum. 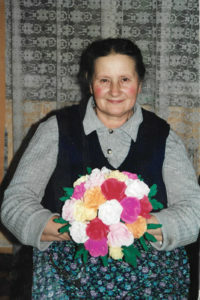 Wojciech’s sister Maria Kosińska is a talented painter and cutout maker. Her cutouts and paintings are displayed in the museum. She painted all the oil paintings on the canvas and the landscapes on all the scenes in the museum. Wojciech’s second sister Ewa Barbara Zabost is an embroiderer. She makes cross-stitch embroideries and not only. Her works of art are displayed in the museum as well. 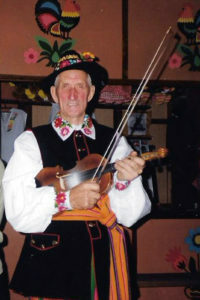 Wojciech’s youngest brother Michał carves small birds and leads his own agricultural holding. Julian and Wanda’s 7 grandchildren are talented as well. on Sundays and holidays from 12 p.m. to 5 p.m.
at weekdays from 9 a.m. to 5 p.m.
in groups of at least 5 people. If there are less than 5 people, it’s possible to fix the entrance free with the museum guide. Next to the museum there is a free car park for several buses. •	on Sundays and holidays from 12 p.m. to 5 p.m.
•	at weekdays from 9 a.m. to 5 p.m. In the Folk Museum of the Brzozowski’s family there are handmade linden sculptures, colourful cut-outs, oil paintings and embroidery. 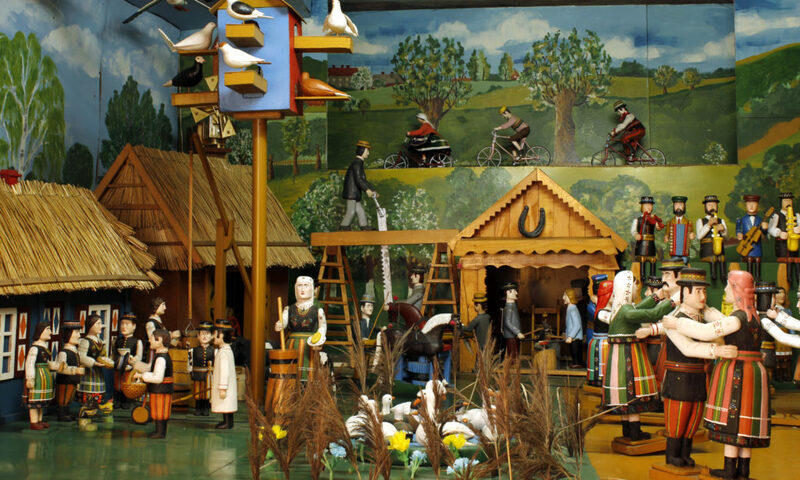 Over 400 wooden figurines (most of them are moving) show religious holidays and scenes of the life of Polish countryside (mainly in the area of Łowicz). There are also the most important characters from sports and history of Poland. In addition, in the exhibition buildings number 3 and 4, there are more than 30 horse carriages from the region of Łowicz.